My friend brought over some homegrown Arizona oranges the other day and we are all smitten by their gloriousness. I have never, EVER tasted anything so delightful that came in the shape of an orange. We had to capture them in picture to commemorate their extreme tastiness before they completely disappear. And look, miraculously I caught a picture of all four kids looking and looking happy. Uncanny. Especially since Q kept calling the oranges 'balls' and trying to throw them hither and thither...which makes trying to take a picture extremely difficult. Mr. C quickly claimed this pear-shaped orange. He loves it for some reason. Its name is Peary...pronounced Parry. Thank you eversomuch friends. We are forever in your debt for the Best Oranges Ever. 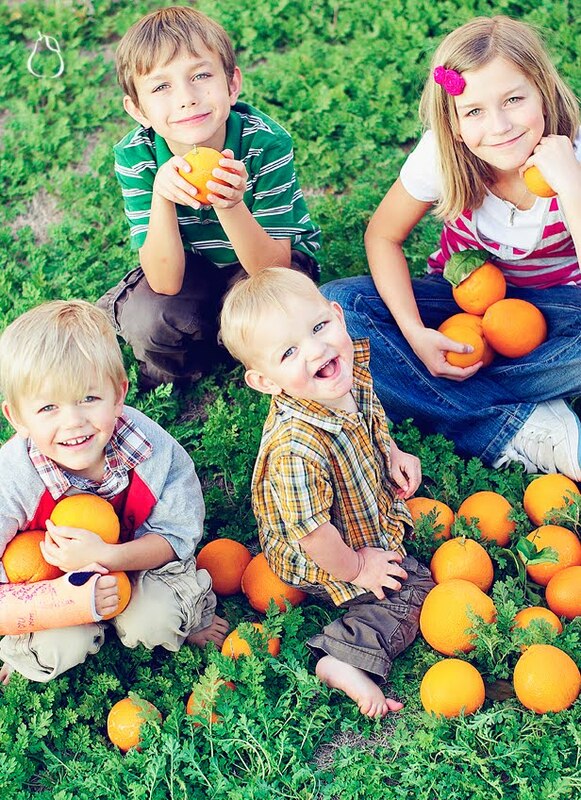 Love the family shot w/ the oranges! How do you get them to cooperate so beautifully? 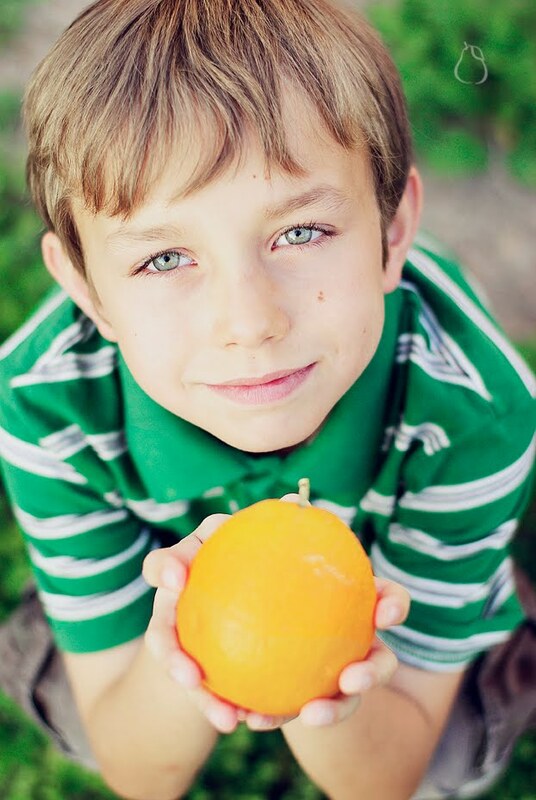 And ya, now that you've had the locally-grown oranges, there's no going back. We're in the mecca of orange groves...Scott will just pick one off the tree when he's out running if he starts getting thirsty. Curse you woman!!! 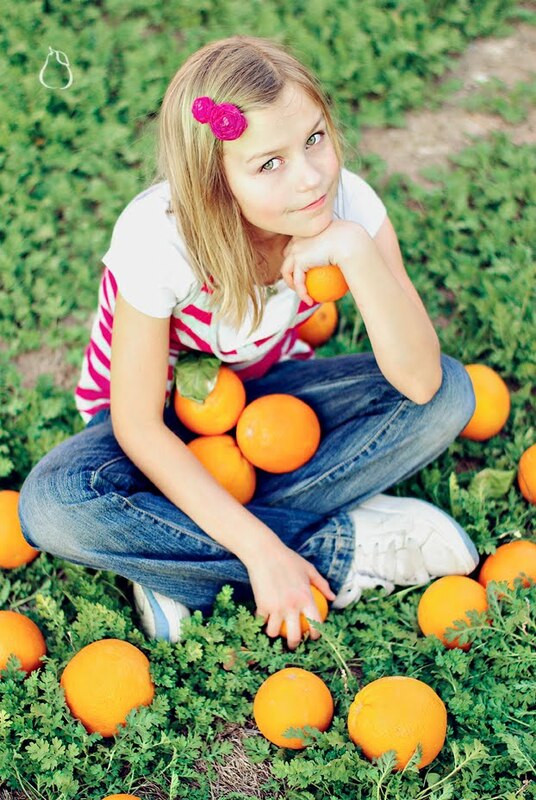 You have pregnant people reading your blog you know, and now I want a good orange. And you know where I live and why I won't be able to get one!!! Gaaaaahhhhh! So mean. So wretched. 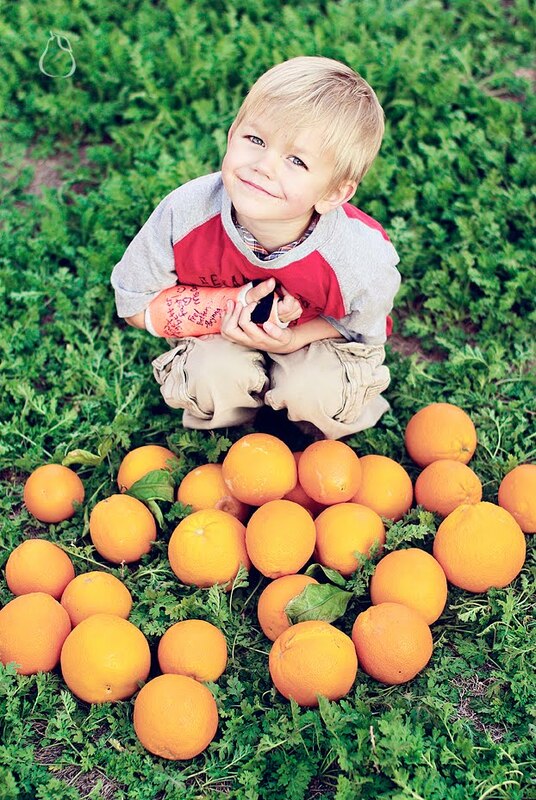 Now someone else knows why we make those trips to get the oranges for Chis's Aunt. We just got some a last week. I'm back to having my delicious smoothies & fresh squeezed orange juice. Yummo! Those pictures are great...seriously. Must be the bright colors and my oh my is that your BEAUTIFUL back yard admist the oranges and children? Magic. What a fun, bright pic! It makes me want to go to California!